You most likely get invited to nice places with nice people! make this Raspberry Cream Cheese and Pretzels Salad. You will instantly be the most loved person at the party. People will start to say things like…. “Shut the front door, the back door and all of the windows. You want to bring this salad with you. I got this recipe out of a wonderful cookbook I have been reading. recipes by Patsy Caldwell and stories by Amy Lyles Wilson. The recipes in this book are very family friendly and look delicious. Fabulous food isn’t the only treasure lingering in the pages. There are great stories written throughout that I thoroughly enjoyed reading. It is a heartwarming read, to be truthful. That is very nice and lovely, indeed. To enter the giveaway leave me a comment telling me the dish/recipe you like to bring most to a gathering. or A Bag Of Chips I Was Really Busy. What ever you like to bring….tell me all about it. Please leave your email address in your comment, so I can contact you if you are one of the lucky winners. You may enter until midnight on Sunday April 24th, winner will be announced on Monday morning April 25th. 1. Throw those pretzels in a small food processor and grind them into coarse crumbs. 2. Add your melted butter and 3 T sugar. Mix until combined. 3. Press the pretzel mixture into a 9×13 pan and bake at 400 degrees for 13 minutes, or until golden brown. Remove from the oven and let it cool completely. 4. In your stand mixer, or in a medium sized mixing bowl beat the cream cheese until smooth. Add your sugar and mix for about 4 minutes. 5. Add the cool whip and mix for one minute, or until everything is well combined. 6. Heat your water up in the microwave until it is boiling. Add the jello and stir until it is all nice and dissolved. 8. Spread the cream cheese mixture over the top of the crust. 9. Pour the beautiful raspberry jello on top, cover and chill for at least 4 hours. See that pretty little crust under there? It’s going to be a friend maker. You never know….Salad can be a really powerful tool. 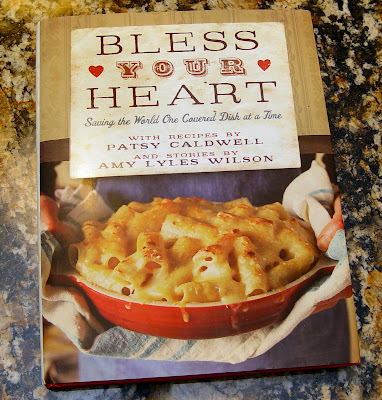 I received the cookbook Bless Your Heart from the Thomas Nelson Publishing Company. I received no compensation for this post, or my review of the book. All ideas and thoughts in the post are my own. I love to bring spinach dip in a bread bowl with celery, carrots & crackers to dip. It's easy, delicious & always a crowd pleaser! I have a yummy yellow cake that I make every Easter – it is just “springy” even though we aren't having spring yet! Yellow cake mix with mandarine oranges. Frosting is cool whip, instant vanilla pudding and crushed pineapple. Yummy, cool and refreshing! I am a dessert bringer when it comes to potlucks. I dream of other (main course or side) dishes to bring weeks ahead of time but end up bringing a dessert every time. Maybe it's my lack of recipes lol. I love to take my orange juice cake, it always gets raves. Or a homemade fruit pie. I just love desserts! Depends on what the event is and what I think others will bring. Probably most often is some kind of fruit tray/salad or one of a variety of deserts. 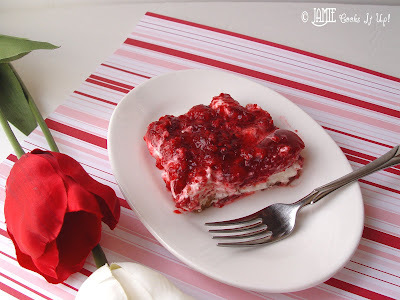 I love this pretzel salad! My grandma makes it all the time, but usually with strawberries. I don't really have a standard food that I take to gatherings. I often take fruit salad of some kind. I like to take fruit muffins once in a while, or I'll take desserts sometimes too. It just depends on the function, my mood, and the ingredients I have on hand. It varies with seasonal goodies from my garden. Homemade pico de gallo with chips is a favorite. Wacky cake or Cream Puff cake for a dessert. Raspberry Chipolte Sauce (homemade) over meatballs and rice for meat dish. Depends on how much time I have & how I feel usually I'll ask. It could be anything from a Decadent Chocolate Cheesecake, to my Luscious Lime Cheesecake bars or some white chocolate key lime crinkle cookies. I take my daughter's chicken enchilada casserole. I've had many people tell me to bring it again, as it is their favorite casserole ever. In the summertime, I love to take a HUGE fruit salad of fresh fruit with vanilla and lemon pudding and sweetened whipped cream…never have to worry about taking any leftovers home. My in-laws have been requesting my banana cake lately. It's so light and delicious! My signature dish that I bring to get-togethers is my “Slice of Heaven” tart (named so by my brother in law). It's an almond apple caramel cheesecake tart. Surprisingly light but totally delicious. Love your blog! I usually take Carmel Apple Salad, it takes minutes to make and is a welcome favorite! Yummy! 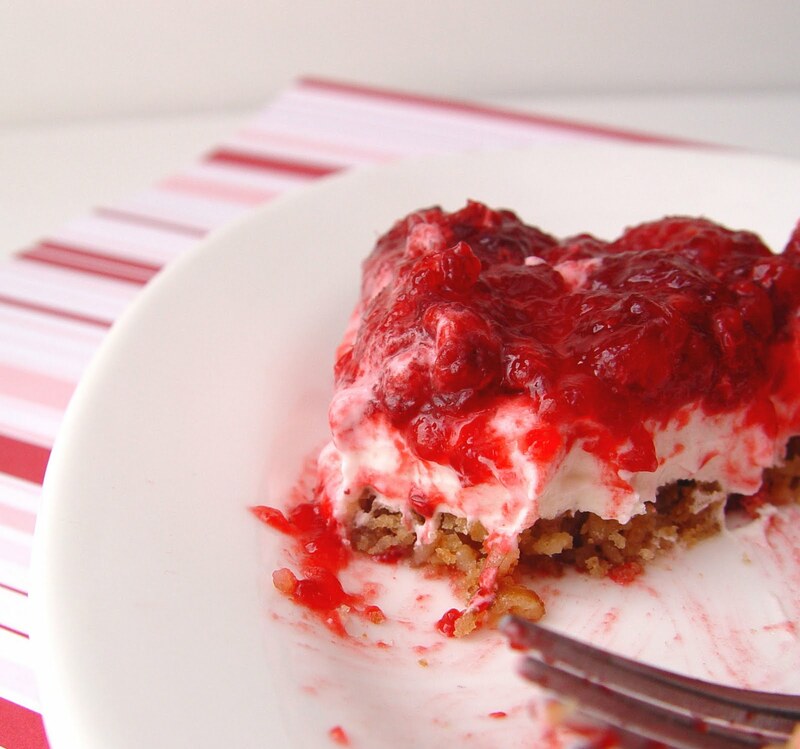 We love your recipes – thanks for sharing them!! We generally take fruit salad (which consists of a tub of whip cream, a large container of strawberry yogurt, 2 bananas sliced, a handful or two of strawberries sliced, and red grapes, sliced in two). So yummy. Also Paula Deens LipSmackin Chocolate Peanut Butter Layer Cake. It is fondly called heart attack cake around our house since #1. you'll have a heart attack when you see how much it costs to buy the stuff to make it and #2 it has 2 or 3 cups of butter in it. But it is heavenly for sure! My family LOVES me to bring homemade rolls to any family dinner. I remember an occasion when my youngest son was sick and I wasn't able to attend a potluck dinner with extended family at the park. I sent my two older boys and my sister called and told me what a snob my 8-year-old son was. He walked past the bag of rolls from Costco and exclaimed, “Store bought rolls!” Up until that time, he had never seen store-bought rolls. I bring a corn and bean salsa. I'll take fruited cabbage salad with poppyseed lemon dressing. Enjoying your blog! In spring & summer I usually take either Texas Sheet Cake or my Lemon sheet cakes 'cause they feed a crowd and there are never any leftovers! In the Fall and at the holidays, I'll make a Carrot cake or sometimes Pumpkin Rolls. Thanks for the giveaway! I bring Chinese Chicken Salad…always a hit!! I have been bringing my pecan fingers, they are seriously delicious and I don't even like pecans! Thanks so much for your help! Emmanuelle from Bordeaux. As for what I often bring to BBQs and such : a noodle salad with feta cheese, cashew nuts, raisins, green peppers, tomatoes, small pieces of grilled bacon, lots of fresh basil, and a seasoning of balsamic vinegar-olive oil… and pasta! It sounds so simple, but the mixture is delicious!… plus a creamy cheese cake! Hello to you there in France. Nice to hear from someone so far away. As for your Cool Whip question. Whipping Cream would work very nicely here. I would whip 1 cup whipping cream 1/8 C sugar and 1/2 t vanilla together, then add it to the recipe where it calls for the cool whip. Good luck! Hope it turns out well for you! would this be something that is ok to sit over night all put together? or would it go soggy? I haven’t ever made it the night before, but I have eaten leftovers the second day and it seems to be just fine. The crust is pretty hearty and with the cream cheese layer between it and the fruit layer…I think you it would work out great. Good luck! This was amazing! I was sad when is was all gone! I think if you aren’t a big crust fan you can make it without the crush. I also added a little more raspberries. I loved it. Big hit! I am always stuck either bringing seafood dip or horse slobber salad. (Lime jello salad) the name is gross but it is great.